I don't know about you, but late pregnancy finds me in a less than charitable mood. Not long ago another solicitor knocked on our door and who else would it be, but someone from the window company we'd purchased from... He started out, "Hi! I see you got our windows. Did you replace all of them?" I returned, "No. And we will never buy anything from you ever again." Towards the middle of the conversation the window company guy said he thought I was going to beat him up. Oh, my bad. Well, when you tell me that you wouldn't buy your products either, that you're looking for another job, oh and that you're not going to report the unusable screens your company installed in our house that we can't use for fear our children might fall out of a second story window - well I'm sorry, but that doesn't make me feel very pleasant feelings. In the end I told him to move along, to avoid knocking on any more doors, and to put his application out for another job. I can tell it like it is with the best of them, but I promise, I am not usually this crazy! During pregnancy? All those hormones, all those emotions? They concentrate significantly. I used to joke that I'm the outspoken one in my group of friends. However, as I've aged I've learned to tone it down and keep it more appropriate. I really think that in general I'm pretty respectful for the most part. But, sometimes during pregnancy I don't (can't?) hold back. Towards late pregnancy something comes over me and I feel this intense surge of mama-bear, protection of all things family, frustration at life, and increased blood volume! The thing is that I'm fully aware that I'm a scary person at this point. I ran into my friend at the grocery store the other night and said laughingly (yet seriously), "Pray for my husband!" He is handling a fragile and grouchy woman and he's doing a fabulous job - but the guy needs some prayers. Seriously. I am having to apologize to my children almost daily as I'm sure my demeanor is rivaling that of a wolverine woken from a deep slumber. Someone knocking on the door too many times. The request to play video games on a nice day. The realization that there was no more creamer in the refrigerator. A spot of dirt on the floor I had just mopped on hands and knees. I feel kind of like a toddler in full fledged tantrum mode. I feel like I cannot handle laundry, less sleep, noise, requests, and making dinner. It is quite possible that I might go out of my mind if someone asks me the same question 3 times in a row again. All this to say, that this is my temporary normal. 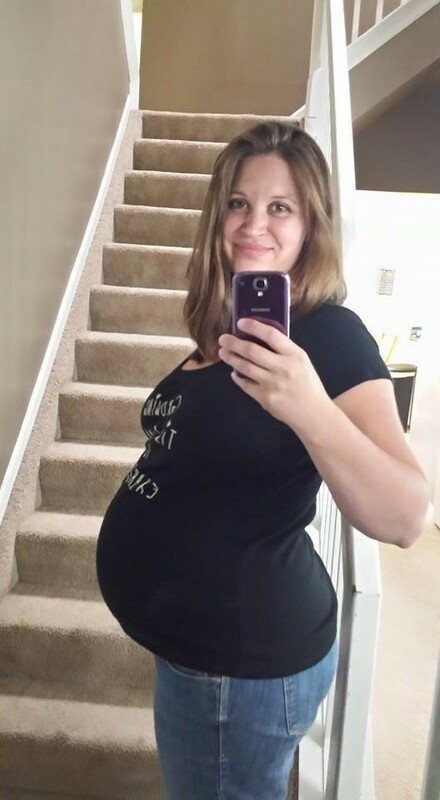 This late pregnancy surge of hormones, nesting, and yes, some anxiety. Much like early pregnancy is fraught with exhaustion, debilitating nausea, loss of energy, and inability to function on a normal level - late pregnancy is fraught with exhaustion, debilitating mood swings, loss of energy, and inability to function on a normal level. So, if you see me in these next couple weeks before I have this awesome baby that I literally can't wait to meet, please grant me an extra measure of grace - especially if I look grouchy, sore, or tired. Because, although I will be one of the very first people to say that I really do love being pregnant I'm also a human just like everyone else and wow does my back hurt!